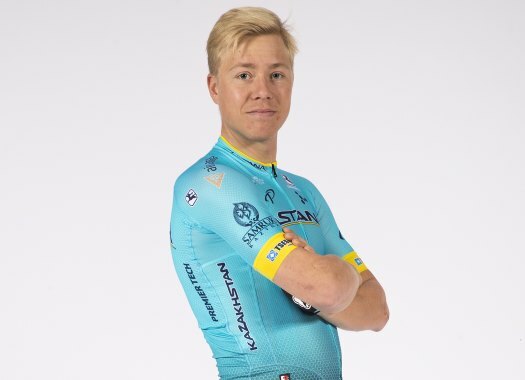 Danish rider Michael Valgren achieved his biggest victory to date by winning the Omloop Het Nieuwsblad on Saturday, choosing the right moment to attack from the group of favorites. Valgren launched his final attack with about two kilometers to go and was never caught again by his companions, including race favorites like Greg Van Avermaet and Oliver Naesen. "We really deserved this win with our team, as we were really strong in today’s final," Valgren said shortly after lifting his trophy. "I attacked several times, but the final time I knew it was the right one and I went full gas. Of course, I had some doubts if I was able to stay in front, but going into the final meters I knew we got it. "I’m really happy with this win, it’s the biggest so far in my career. I hope I can build on this for the next races to come. It was really special." Things went exactly according to plan for Astana, which had three riders in the final lead group of 12. "Our strategy was working out fine, as we were protecting our four possible cards to play during the whole day, and then at the Kapelmuur almost all four were in the leading group," explained sports director Lars Michaelson. "It was one big teamwork today, with great work of all the riders but also from all the staff who did a perfect job behind the scenes. Everybody contributed and then Michael had the legs to finish it off, he really deserves it."